The neutrinos, which escape directly from the core result in further energy loss and even faster collapse. The core collapses so rapidly that it effectively collapses out from under the stellar envelope. When the core has collapsed down to a size of about 10 km, neutron degeneracy sets in cusing the core to stiffen and the infalling material from the envelope to rebound in a shockwave outward from the core. This shockwave drives the remaining material from the envelope outward, compressing it and heating it as it moves through. 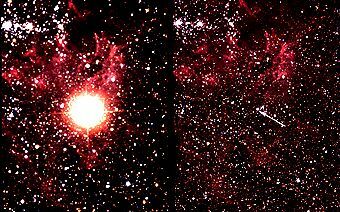 The net result is the formation of a neutron star in the stellar core and the total disruption of the remainder of the star with the liberation of about 1053ergs of energy in neutrinos and 1051ergs of kinetic and luminous energy. (The luminous energy release is about the amount of energy that the sun will release in its 10 billion year lifetime). Here is a NASA supernova animation of a supernova explosion and formation of a pulsar. The final death of a massive star is a Type II supernova. As described here there are two types of supernovae. A white dwarf star in a binary star system may accrete material from its companion star. If the white dwarf exceeds the 1.44M limit for support by electron degeneracy, it will collapse and produce a Type Ia supernova. Type I and II supernovae can be distinguished by their light curves and spectral emission lines. Here is some more supernova background and further links here. A supernova explosion may for a short period of time shine as brightly as the hundreds of billions of stars in its galaxy. Here's an example - a time series of photos of SN 1998S in the galaxy NGC 3877 taken in March--June 1998. For the first time astronomers have observations of the star that exploded, the supernova precursor, known as Sk -69 202 from a catalog of stars in the LMC by N. Sanduleak. Sk -69 202, shown in the photograph above was a B3I sopergiant with an atmospheric temperature, T = 16,000K, a luminosity of about 100,000L , and an estimated mass of about 20M . An unexpected aspect of this is that Sk -69 202 was a blue supergiant (note temperature and spectral type) rather than a red supergiant. At neutrino detectors in Japan (Kamiokande) and the US (IMB) neutrinos were detected from the collapse of the stellar core of Sk -69 202. Only about 20 neutrinos were detected of nearly 1059 neutrinos emitted as the core collapsed. But, allowing for the weakness of neutrino interactions, this was just about the right number, strongly confirming our picture of supernova explosions and the formation of neutron stars. Continuing observations have provided a wealth of information about the supernova shockwave as it moves outward into the circumstellar medium, as described in this Scientific American article. SN 1006 in Centaurus in the southern sky. SN 1054 - The Crab Supernova in Taurus recorded by Chinese and Native American astronomers. SN 1572 - Tycho's Supernova, studied in detail by Tycho Brahe. plus other probable & possible Milky Way supernovae. According to theory, the core of the star that remains after a supernova explosion is a tiny (R ~ 10km) remnant of extremely high density neutrons, supported by neutron degeneracy -- a neutron star. The existence of Neutron Stars was predicted by Baade & Zwicky (1934) and Oppenheimer (1939). But how to detect such a small remnant? As with many things in astronomy, the discovery came in unexpected fashion with the discovery of Pulsars. In 1967, Cambridge graduate student Jocelyn Bell (now Burnell) and her advisor, Anthony Hewish, were using a special radio telescope to look for radio scintillation, fluctuations in the signals from distant radio sources producted by turbulence in the interplanetary and interstellar plasma similar to the twinkling of stars caused by atmospheric seeing. On November 28, Bell discovered a source with an exceptionally regular pattern of radio flashes. These radio flashes occurred every 1 1/3 seconds like clockwork. Puzzled by what sort of object could produce such a regular pattern, the source was initially dubbed "LGM" - standing for little green men, because the only source that they could imagine that could be so regular was some sort of extraterrestrial technical civilization. After a few weeks, however, three more rapidly pulsating sources were detected, all with different periods. They were dubbed "pulsars." Original chart record of Cambridge Pulsar 1919+21, the first pulsar. What were the pulsars? From the short pulse duration and the rapid pulse rate, astronomers concluded that the pulsars must be exceedingly small objects. The radio pulses must come either from radial pulsations of a star, or from a rotation of a beam of light, like a lighthouse beam. Normal stars or even white dwarfs are too big to pulsate that fast, and rotation rates of several times per second would cause even the most compact stars to fly apart. The answer to the nature of the pulsars came with the discovery of a pulsar in the direction of the Crab nebula , with a pulse rate of 30 times per second -- then the most rapid pulsar known. Continued observation of the Crab Pulsar showed that it was slowing down -- its period was increasing by 38 nanoseconds per day. This first confirmed that the pulses are produced by rotation; a pulsating object pulses only at its natural frequency. More importantly, it simultaneously solved two mysteries: the nature of pulsars and why the Crab Nebula continues to shine so brightly 1000 years after the supernova explosion. Spinning objects have rotational energy of motion (kinetic energy)just as moving objects have translational energy of motion. A simple calculation showed that a rapidly spinning neutron star slowing down by 38 nanoseconds per day releases almost exactly the energy which is being radiated by the Crab Nebula, just the p[lace where Baade & Zwicky would predict that a neutron star might have been formed. Although the details of how the pulsar's rotational energy is transformed into the luminous energy of the nebula, this agreement was too good to be coincidence --- astronomers were certain that the elusive neutron stars had been discovered! Anthony Hewish later shared in the Nobel Prize for the discovery of pulsars. Conservation of Angular Momentum - as a spinning object decreases its size, conservation of angular momentum dictates that its rate of spinning must increase. This is the physics that causes a spinning ice skater to "spin-up" as he or she pulls arms and legs inward. A star like the sun, rotating once per month would rotate about 1000 times per second when contracted down to 10 km in size. Conservation of Magnetic Flux - lines of magnetic force will be carried along with the collapse of the plasma core of the star. As the core collapses the magnetic field lines are pulled more closely together, intensifying the magnetic field to valuess of the order of 1012 gauss. Energy is transported from the spinning neutron star into the nebula by the magnetic field. HST has provided dramatic evidence of the interaction of the Crab Pulsar and the supernova remnant. This Picture of the Day and this HST Press release show the ripples produced by the pulsar moving outward through the nebula, also shown in this MPEG movie. Here is an excellent and detailed Introduction to Neutron Stars by Cole Miller at Chicago. Listen to the sounds of pulsars from the Princeton Pulsar Group and also at England's Jodrell Bank Radio Observatory (includes Crab Pulsar). Binary Pulsar which resulted in the award of the Nobel Prize in Physics to Joe Taylor and Russell Hulse, its discoverers. More about the binary pulsar next lecture. From extremely precise timing experiments, radio astronomers have detected shifts in pulsar periods caused by the orbital motion of the neutron star and accompanying planets. Bursting Pulsar discovered by RXTE. Recently the discovery of stars which produce bursts of gamma-rays with pulsar-like periodicities has suggested the existence of a new class of pulsar which are inferred to have exceptionally high magnetic fields, as high as 1015 gauss (1000 times the magnetic field of a typical pulsar). The discoverers have dubbed these pulsars magnetars. Here is a detailed account by one of the discoverers. (The existence of such high magnetic fields and of magnetars remains controversial). Rgrav = 2GM/c2 none ?